Oh. Em. Gee. You guys. 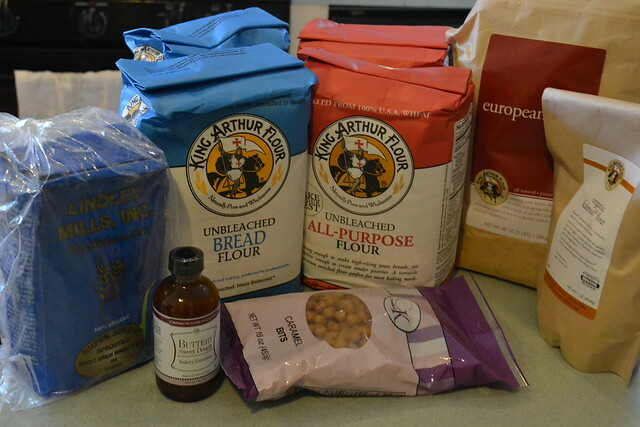 My order from King Arthur Flour arrived today. I am. So. Excited. My sweet, sweet mother-in-law gave me a gift card for my birthday back in June, and I haven't spent it until last week when KAF had a big $3 shipping deal. I splurged. Here's what I purchased (and I still have a bit more on my card!) The descriptions are from their website. 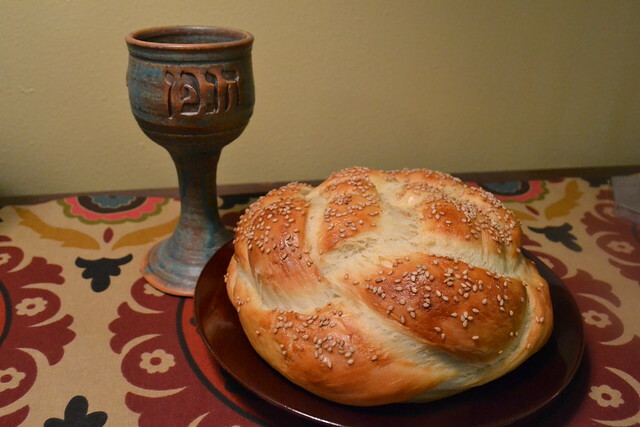 Unbleached Bread Flour - King Arthur’s unbleached, unbromated, high-gluten bread flour, milled from hard red spring wheat grown chiefly in the Dakotas, is perfect for yeasted baked goods-bread, rolls, pizza, and more. Unbleached All Purpose Flour - - King Arthur unbleached, unbromated all-purpose flour (11.7% protein) is your very best friend in the kitchen. European-Style Artisan Bread Flour - Ideal for your favorite French and Italian loaves, King Arthur's Artisan Bread Flour is the style of medium-protein flour French and Italian bakers use for their signature hearth breads. Organic Sprouted Whole Wheat Flour - Sprouted wheat is the best way to access the grain’s nutritional benefits. As the wheat berry grows, vitamins are formed that greatly enhance the nutrition and digestibility of the wheat. Sprouted berries are dried, then ground into flour. Organic Kamut Flour - Discover the goodness of ancient grains. This Egyptian relative of wheat, now cultivated in North America, adds fiber, protein, and a slightly sweet taste to all your baking. Caramel Bits - Creamy bits mix and melt easily in cakes, cookies, and muffins to create rivulets of gooey goodness. Buttery Sweet Dough - There's a particular flavor to the Danish, sweet rolls and coffeecakes you get at the store. Is it a hint of vanilla, or butter, or...? Add a few drops of this flavoring to your favorite sweet bread recipe, and your family and friends will be clamoring for the name of the bakery you visited. Please Note: I was not paid anything and did not receive anything for writing this post. KAF doesn't even know I'm writing it. I'm just really excited to start my baking with my new ingredients! Wow, I'm all sorts of behind on posting, so I do apologize. I have a new job as my synagogue's youth advisor, and we had our first program on Sunday. That combined with S'lichot on Saturday night prevented my postings! How is YOUR high holiday preparation going? 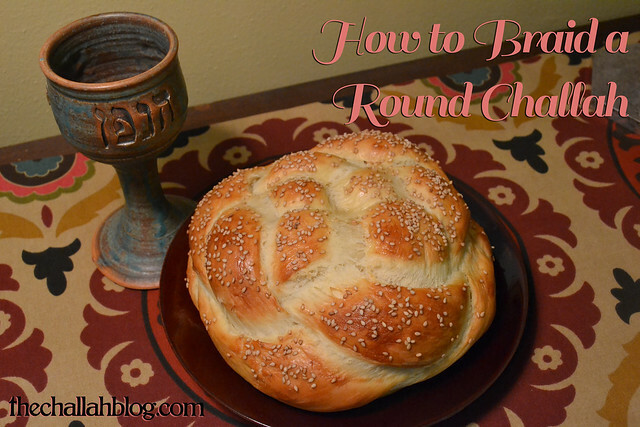 Here's how I do the round braided challah. Someone recently posted this link on facebook, which is the same as what I do, only I don't do that last flipping step. I hadn't seen that link until I started this tutorial, so please feel free to click on it and use it. 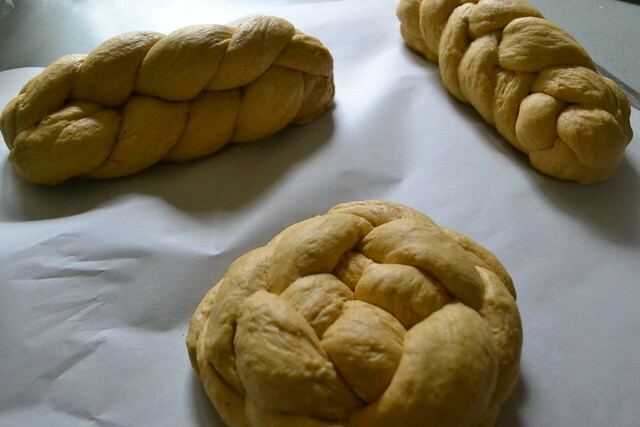 The braided round challah is really easy. If you can braid three-strand braids or hair, then you can do this braid. 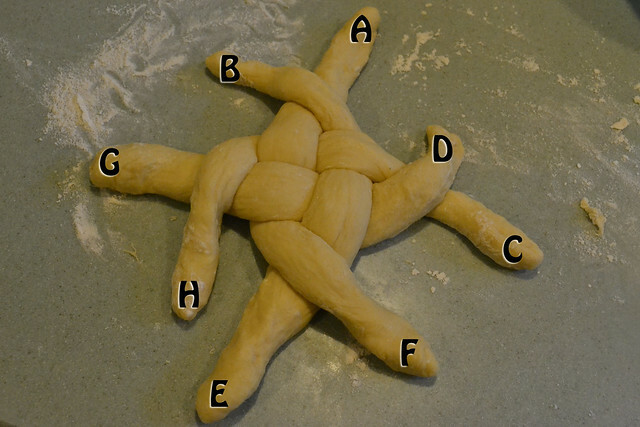 Step One - Lay out four strands of challah thus... the longer they are, they more braids you'll do. 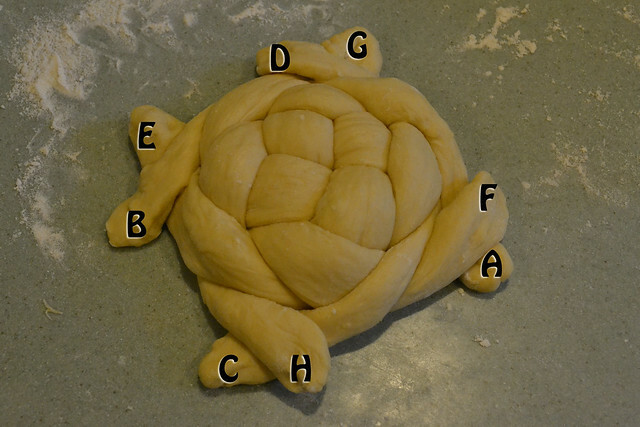 Step Two - Bring every other strand over the one to it's counterclockwise. (B over A, D over C, etc). 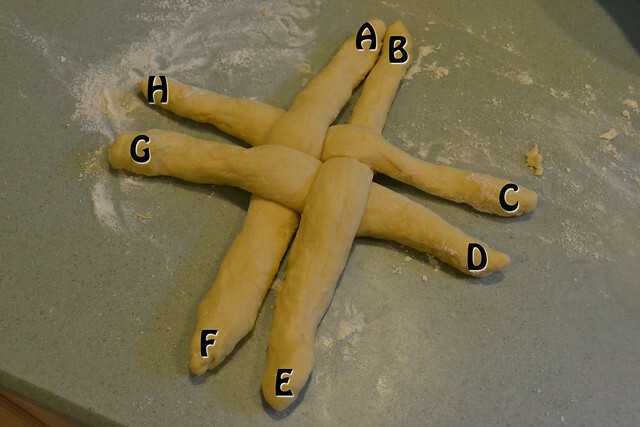 Alternatively, you could start clockwise (you'll see why in Step Three). 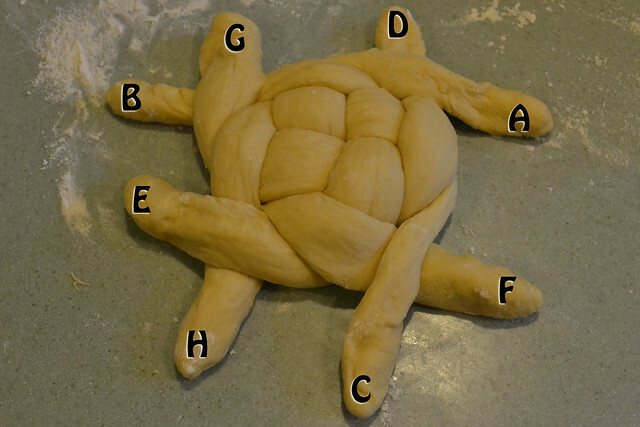 Step Three - Now, reverse, go clockwise instead of counterclockwise. Step Four - Repeat counterclockwise again. Step Five - Tuck all your ends under. Here's where many other tutorials say to bunch up and flip, but I was too scared, so I didn't, and I like the way it looks unflipped. 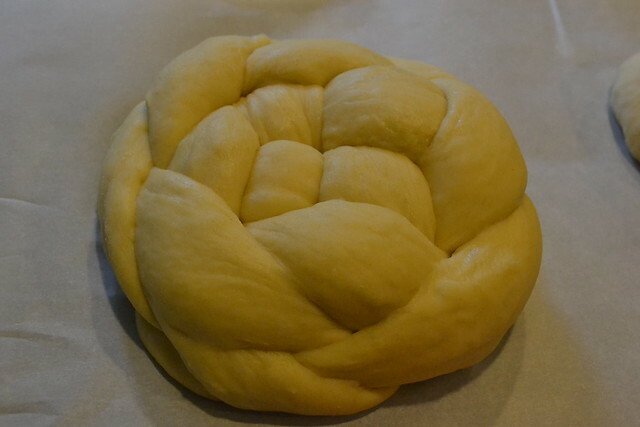 Note: I find I sometimes am needing to bake the round braids a bit longer than I usually would (sometimes foiling to prevent over-browning) because the centers still seem a bit doughy and don't reach 180/190 degrees. I add time in 3-5 minute increments. 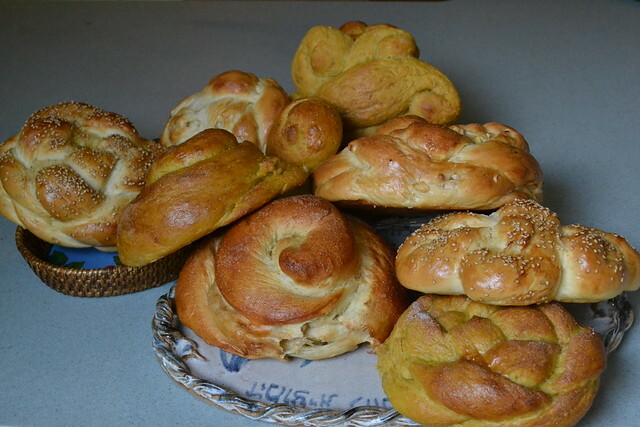 Traditionally, some Ashkenazim formed other edible symbols out of the dough — things like crowns, which represented God’s majesty; ladders (a shape also commonly eaten before the Yom Kippur fast) to represent Moses’ ascent on Mount Sinai and our collective spiritual ascent throughout the holiday season; and, my favorite, birds. 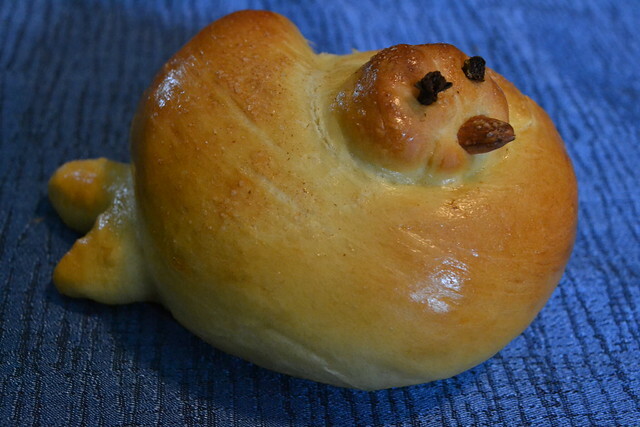 Now, unlike the stuffed apple challah, you're going to knead this right into the dough, a la chocolate chips. It's sticky, somewhat messy business, so have some extra flour on hand to knead in as necessary. What I love about this method is that the apples get incorporated throughout, so each bite has one. 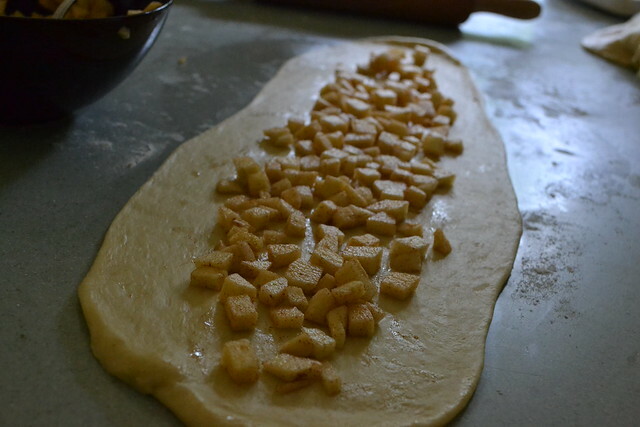 Plus, the whole dough becomes cinnamon scented, which is absolutely wonderful. Egg wash and top with cinnamon sugar if you like. Bake as normal. 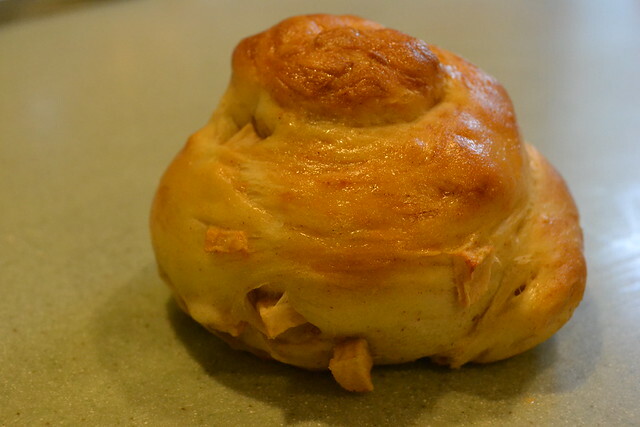 We've made Apple Cinnamon Challah before, but the method has never been completely finalized. 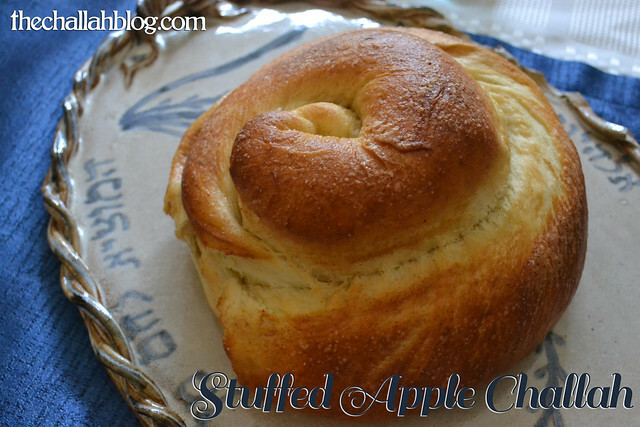 This past Shabbat, I experimented with two different methods for apples-in-challah. 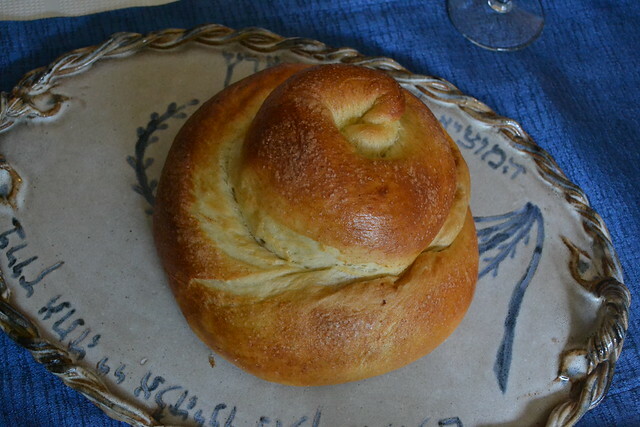 This version uses my stuff-and-roll method which we've also used for Almond Cinnamon Sugar Challah. It's definitely a bit tougher with apples because there's a lot more air to be squished out. I asked The Hazz about this while rolling, and he said he usually tries to get most of the air out as possible. With this method, don't try to be perfect. One thing I love about challah is that it's perfect no matter what so if the apples leak out a bit during baking, who cares? It just means more oozy goodness for you. 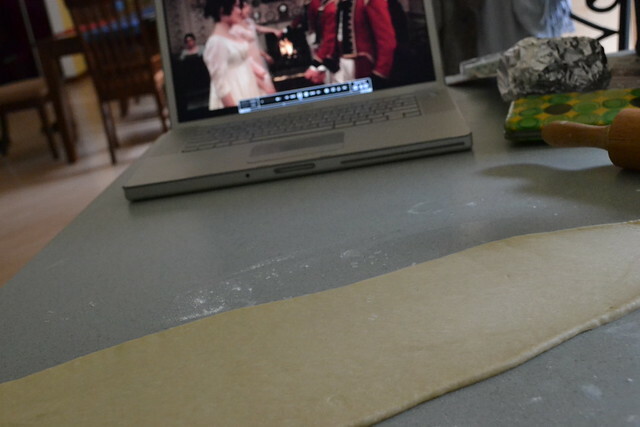 Using a rolling pin, roll a long flat, somewhat narrow (about 6 inches wide by a good foot and a half long) piece. Fill with apples as below. Bonus points to anyone who can name the movie I was watching while doing this... best. movie. ever. 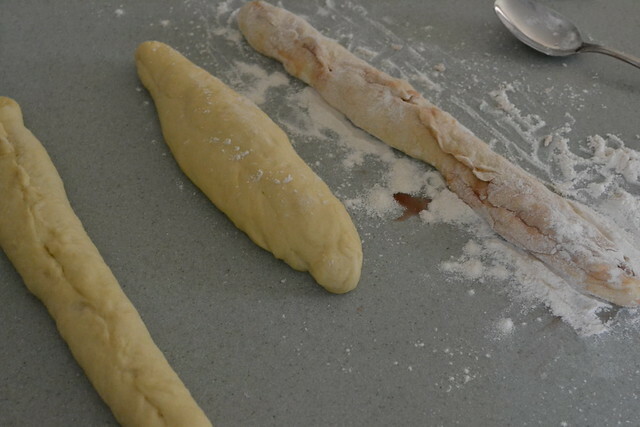 After filling, roll together and seal, adding extra flour if necessary. Coil from one side around. Egg wash and sprinkle with cinnamon sugar if you like. Bake as normal, keeping in mind you may need a bit of extra time with some foil on top of the loaves to prevent too much browning while the gooey center gets completely baked. I needed about 8 extra minutes, but your oven may vary so check every 3-5. Happy baking. 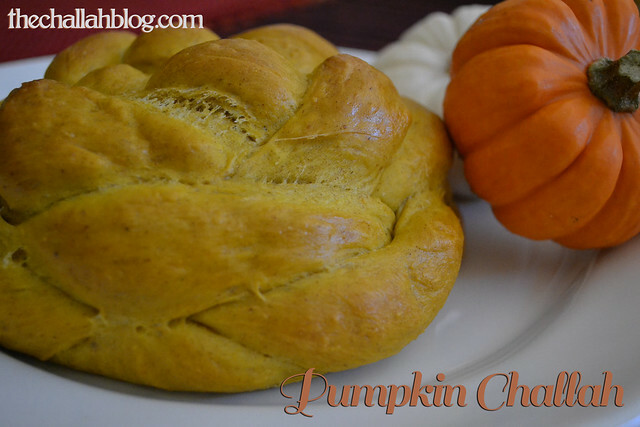 Make sure to read the updated version of Pumpkin Challah here! 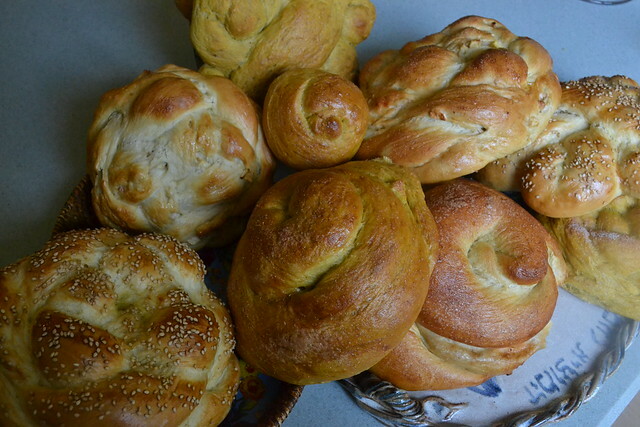 We've actually made pumpkin challah before, though I've never blogged about it because we hadn't quite finalized the recipe. I'm in a fall mood with cool, tights-wearing weather, spicy foods, and the first of the early turning leaves. 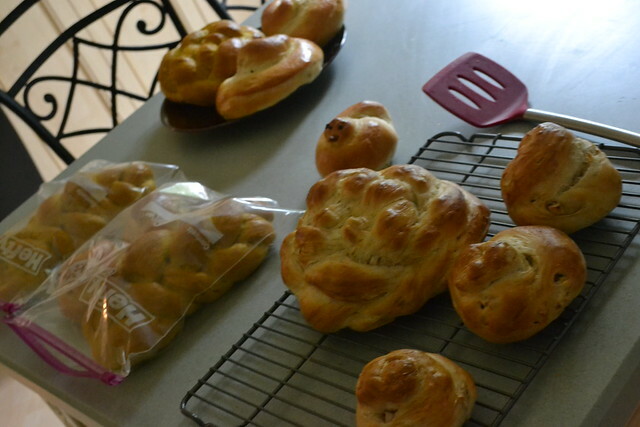 This past Friday, I had no commitments, so what better than a Rosh Hashanah Test Kitchen. Three families (plus us!) 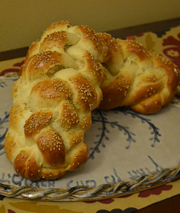 were the lucky winners of "Take some of my challah off my hands! 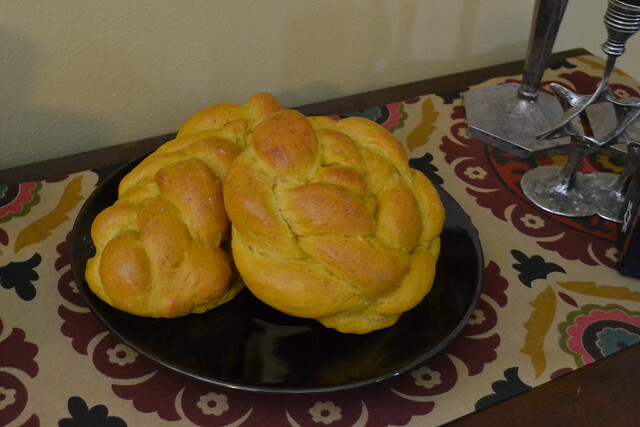 And now, I bring you Pumpkin Challah. 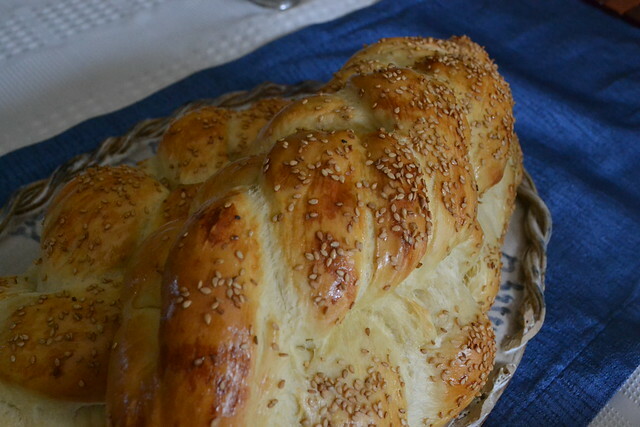 I'm thinking this more of a Sukkot food, but heck, it seems great for Rosh Hashanah as well, especially with squash soups and herby chicken. Bake at 350 for around 30 minutes or until internal temperature reaches 180-200 degrees. 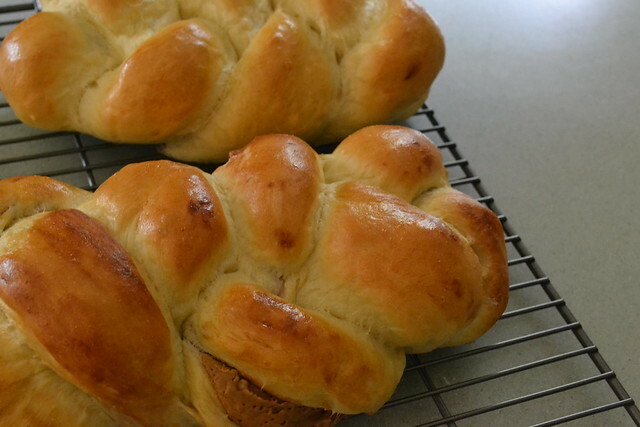 PB&J Challah - DON'T DO IT! So, I'm going to preface this whole post with three words. DON'T DO IT! No, well, that's not very nice. Give it a shot. Try it out. Really, maybe you won't be as uber-disappointed as I was in the end result. 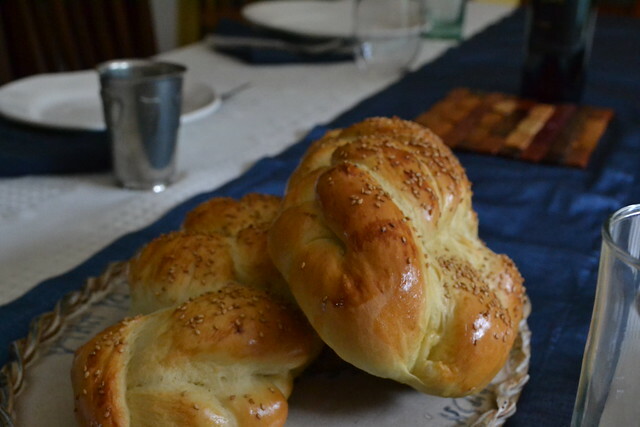 Because PB&J Challah was such an "eh..." I've put off the post. 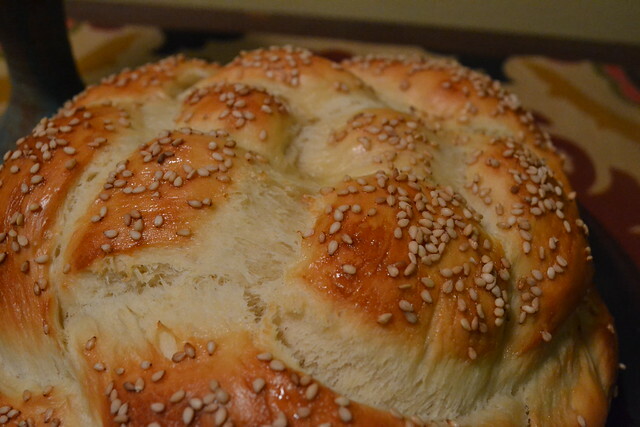 I wasn't excited about the post because I was so unexcited about the end result of the bread. In theory, it should be great, right? 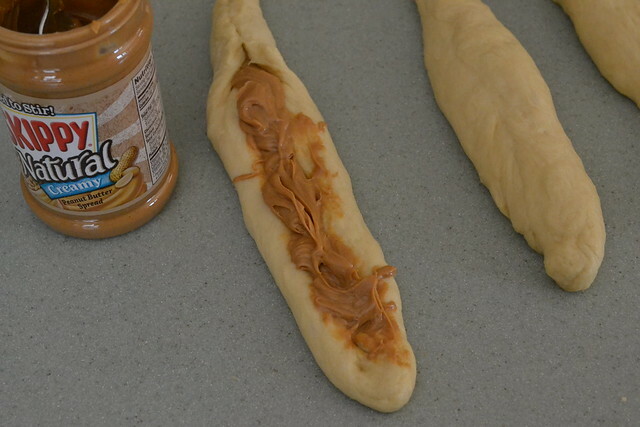 We've done stuffed challah for Nutella, and the whole peanut butter-in-the-dough challah is tasty but really dry. So, I combined the two ideas. Three-stranded braid. One peanut butter filled, one jelly filled, one just bread. First of all, jelly = epic fail. Maaaaaybe jam would work? Maybe just fruit filled? I don't know, but I ended up yelling to The Hazz in the living, "Help!" and having a goopy messy of fruity blob (descriptive, no?). The peanut butter went in well. But the baking result was so aaaaaaverage. The peanut butter sort of turned into hard crusty... peanut butter crust? The jelly disappeared almost entirely (I have no idea where it went) and the overall dough flavor was just off as a result. It looks pretty but it was soooo blah! I've got a post in the works for you, but The Hazz and The Mrs. are going on a date to the movies tonight, so it'll have to wait until tomorrow. 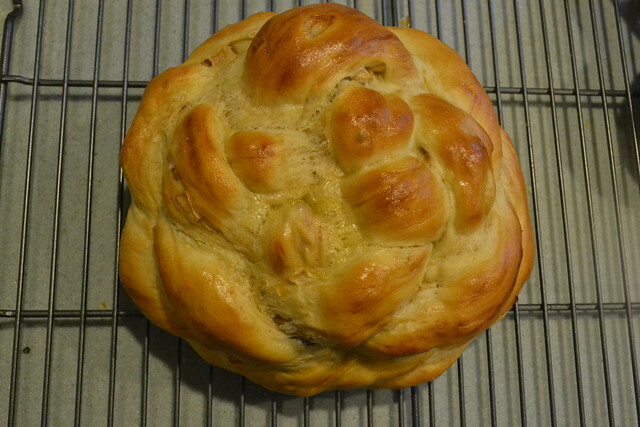 Also, LeighAnn made Nutella Challah, which never gets old.